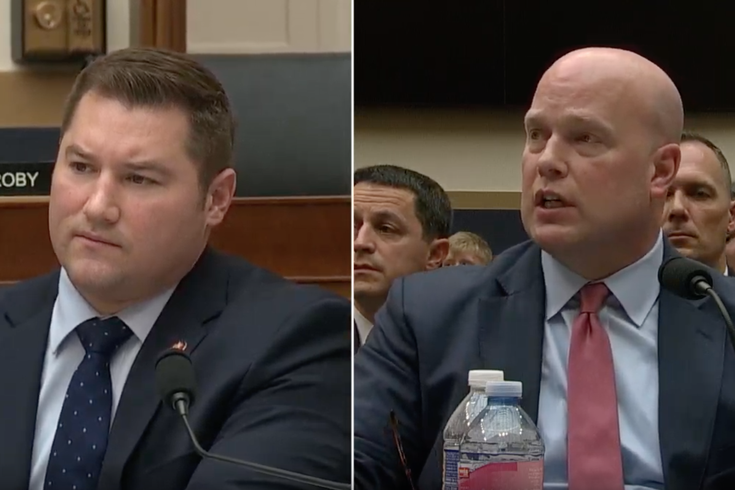 Guy Reschenthaler (left) and Matthew Whitaker, pictured during Friday's House Judiciary Committee hearing. The House Judiciary Committee hearing for Acting Attorney General Matt Whitaker on Friday was meant to determine whether Whitaker had interfered with special counsel Robert Mueller’s investigation, among other things. One Pennsylvania representative, however, turned the spotlight on the city of Philadelphia for a moment. Rep. Guy Reschenthaler (R-14) used his five minutes to discuss sanctuary cities — cities which limit cooperation with the national government’s effort to enforce immigration law — and what Whitaker was doing to stop them. "In my home state of Pennsylvania, the sanctuary city of Philadelphia has released at least three child molesters back on to the streets. Everyone knows the tragic story of Kate Steinle, who was murdered by an illegal immigrant who was convicted of seven felonies and deported five times. Those child molesters in Philadelphia, the murderer of Kate Steinle, they were all released because some city wanted to score cheap political points. That’s why I’m focused on sanctuary cities." Though they appeared in the same breath, the Kate Steinle case Reschenthaler referenced occurred in San Francisco, not Philadelphia. The three freed child molesters Reschenthaler referenced are likely the three Sen. Pat Toomey mentioned in a 2017 editorial for the Philadelphia Inquirer: Winston Enrique Perez Pilarte, Ramon Aguirre-Ochoa, and Jose Palermo-Ramirez. Whitaker went on to explain, during his exchange with Reschenthaler, that the Department of Justice was withholding law enforcement grants from sanctuary cities like Philadelphia. Later in the hearing, Pennsylvania Rep. Mary Gay Scanlon (D-5) began her five minutes to pointedly ask Whitaker about a November 2017 ruling in which a U.S. District Judge ruled the Department of Justice couldn't legally withhold law enforcement grants. Whitaker chose not to answer questions about the ruling during the contentious session. Last July, Philadelphia stopped giving U.S. Immigrations and Customs Enforcement access to its real-time arrest database.